Rob Kardashian and Blac Chyna broke up over the weekend – and the split seemed to come out of nowhere. Eagle-eyed fans took notice when Rob logged on to his Instagram account and deleted all of his photos of himself and his girlfriend, and they’re lovefests. Then Rob Kardashian proceeded to unfollow all of his family members – including his sisters Kim Kardashian, Khloe Kardashian, Kylie Jenner, and Kendall Jenner. Momager Kris Jenner and ex brother-in-law Scott Disick also got the axe. It’s unclear what caused the split – but seeing as how Rob deleted all of his family members – there is a good indication that his family was behind it, it’s no secret that they have been trying to break up Rob and Chyna for months. 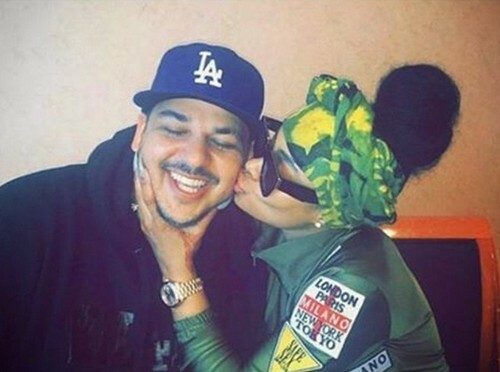 Regardless, their break-up was short lived, Blac Chyna was not about to let the Kardashians win and it was only a matter of time before she and Rob made up. Chyna deleted her post about proudly re-entering the hoe world, and Rob updated his Instagram account and stated they were still together. Seeing as how the media has pretty much supported Rob and Chyna’s relationship – because who doesn’t love seeing someone get one up on the Kardashians, it’s safe to say the “outsiders” Rob is referring to is his own family. It looks like the Rob’s momager and sisters have their work cut out for them – because Chyna is not going anywhere, and refuses to let them come between her and Rob. Right about now, Kylie Jenner is probably thinking twice about stealing Blac Chyna’s baby-daddy. Khloe Kardashian Wants Brother Rob Kardashian Back Again After Blac Chyna Fixes Him? Rob Kardashian Reveals Blac Chyna Pregnant: Kris Jenner Mortified By Stripper’s Baby?